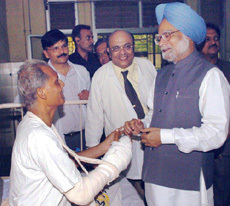 The Prime Minister, Dr Manmohan Singh, today virtually put the peace process with Pakistan in cold storage. In Mumbai to obtain a first hand account of the serial bomb blasts which rocked the metropolitan city on Tuesday last, the usually mild-mannered Prime Minister used strong words to hit out at Pakistan. Investigators probing the serial blasts are tying themselves in knots over the explosive used on Tuesday. While officials on Thursday insisted that RDX was used, today they claimed that other explosives like dynamite or ammonium nitrate may have been used as well. Should the peace process with Pakistan be stopped till terrorism stops? The Intelligence Bureau has reportedly alerted the Bihar Government against the growing activities of Pakistan's Inter-service Intelligence on the Indo-Nepal border. Keeping in mind the huge increase in the cost of agricultural inputs, the Punjab Government has sought an increase of nearly 25 per cent in the MSP for cereal crops like wheat and paddy to make agriculture a sustainable avocation in the state. A complete shutdown was observed and demonstrations were held in Tangmarg town, gateway to the tourist resort of Gulmarg, in protest against the grenade attack on a tourist bus at Gulmarg in which 13 tourists were injured on Wednesday. 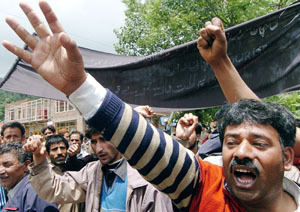 The Centre has asked the Jammu and Kashmir government to probe the veracity of claims that Al-Qaida had set up a wing in the state. Home Ministry officials said the state police has been asked to do voice test of the phone message to a local news agency from a man who claimed to be spokesperson of Al-Qaida. Foreign Secretary Shyam Saran today cautioned that India would have to pay a price if it were to break the moratorium on further nuclear tests. “If this has to be done, I am sure, the government will decide in the supreme national interest,” Mr Saran said while speaking at a discussion on “Indo-US Joint Statement of July 2005: A Year Later”.